Permission has been granted through NPPF Paragraph 55 for this new house on the edge of the village of Ravenstone. 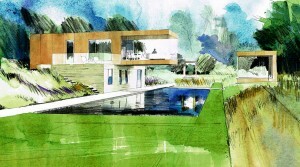 Landform modifications will create a miniature valley setting for the striking home by architects AR Design Studio. 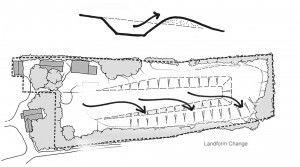 Inspiration for the valley came from seeing that existing buildings on site were located in old quarry excavations and in observing the way that a plough slices through the ground and folds soil over to simultaneously cut and fill the ground. 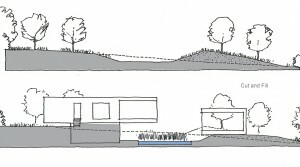 Banks around the valley are to be planted with wild flowers and naturalised perennials to contrast with the smooth texture of the central finely mown lawn and reflecting pool. 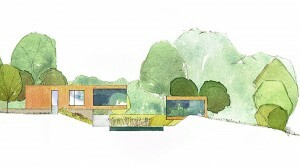 The depth of the valley will be emphasised by a perimeter of orchard trees and by the upper ground floor of the house projecting into open space above the pond. 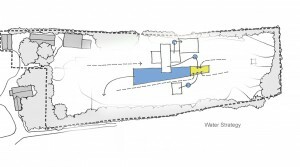 The centrally placed pond with its reedbed is the focus of the garden, bringing light and reflection into the space but also serving as part of the water treatment and circulation strategy. 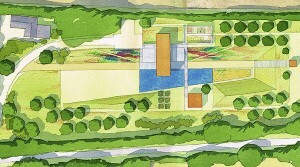 This would be looked down on from the raised drive, the glazed upper ground floor of the house and the garden paths. Stepping stones across the pond connect the house to its pavilion placed on the opposite side of the water.